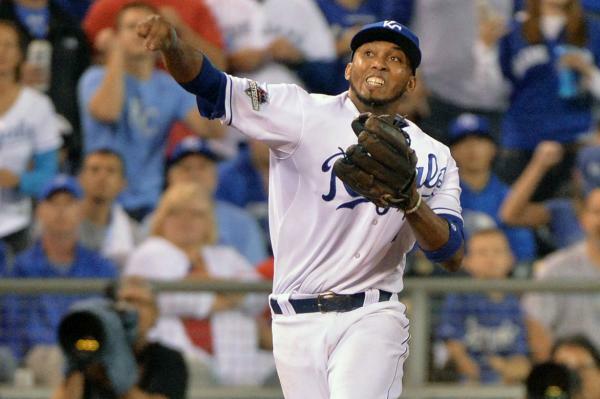 Ladies & gentlemen, please meet your ALCS MVP Alcides Escobar. Please allow me to reiterate, this is not Josh Donaldson (as so many pundits predicted) nor is it Jose Bautista (as others surmised), this is Alcides Escobar. You know, of the Kansas City Royals, Escobars. He’s the same Escobar that has Sabermetricians confounded. I should be tired, but I just finished watching FSKC’s post-game coverage and, once again, I’m too hyped to go to sleep. My wish is that my immediate family and good friends could be here to experience the joy with me (my friend, Kerri, was here to enjoy the win, but call me greedy, I want more). They can’t, so I have to satisfy myself with texts or phone calls. For anyone wondering, I called this as a Game 6 win and my friends, Kristine & Scott, can corroborate this. I actually not only called a Game 6 win, but I even called a 3-1 victory. Had Madson not made his high fastball mistake to Bautista, I would’ve been right. Oh well, prognostication for future success will ensue. Oh well, the #hotdogsurprise (long story) will have to wait until the World Series begins next week.